We can supply all your needs for your Archery Events. If you have any suggestions, please let us know. 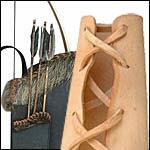 In this section you will find the Archer's Quiver, the Sherwood Quiver, the Nottingham Quiver, the Small Leather Quiver, the Hunter's Quiver, the Crossbow Quiver, bow bags, finger guard tabs and archery gloves. With so many items available, you can't help but look around! These Brown Suede Gloves are perfect for costumes, reenactment, LARP, and swordsmanship. Available in sizes small, medium, and large. Made by Palnatoke. Made of the finest deerskin leather found in the New World. These gloves are soft, supple, and fit like a...dream. Optional accent colors at the wrist allow you to match these gloves with the rest of your attire. The Ranger is known for his ability with the sword and his bravery in combat, which is why this pair of Leather Rangers gloves is so important. A better grip on your weapon is needed as you wrestle though dense forest. Pick pockets, Thieves, Rangers and Warriors will appreciate the usefulness of this pair of Black Leather Laced Gloves. Soft leather, three quarter length gloves with an intricate stitched pattern. Great for Re-enactments and LARP. Every archer needs a bow bag, or sock, to protect their treasured bow. This small bow bag measures 74" to fit a 68" bow.